This Saturday, October 13th, will see the track play host to the final event of the 2018 racing season in Atlantic Canada, as well as the final event of the tracks 50th Anniversary Season. Rebranded as “The Very Best Fall Shootout” for 2018, the fall classic has earned a reputation as one of the regions top grassroots racing events, and a great way to wrap up the regional racing season. After the success of last years race, a 100 lap Street Stock race will highlight the show once again. Two dozen entries have been filed for the Street Stock portion of the event, a list that features some of the top talent from all across the Maritimes. It’s a list that includes several championship winning drivers, including Luc McLaughlin, who has 4 championships between various divisions at various tracks, 2018 Petty Raceway Street Stock champion and former Bandolero champion Michael Cormier, 2017 Petty Raceway Street Stock champion Logan Power, 6-time Scotia Speedworld truck champion Dan Smith, 2013 Speedway 660 champion Roger Slocum, and 2018 Oyster Bed Speedway Super Series champion Brandon Snow. Brunswick 100 winner Alex Sheehan is also expected to be in attendance, and he joins Snow, as well as Mitchell Arsenault, Brodie MacQuarrie, and Tayler Albert as drivers registered to make the trip across the Confederation Bridge to compete. Harvey’s Justin Cole led the most laps in the 2017 running of the Street Stock 100 and will be returning looking to redeem himself, while Petty Raceway Rookie of the Year Brandon Carter scored a 2nd place finish in the most recent event at Speedway Miramichi. Speedway 660 standouts Riley Goodwin, who has scored a podium in the Fall Shootout the past 2 years, and Kyle MacKinnon, who captured Rookie of the Year honours at Speedway 660 in 2018, will also make the trip to Miramichi. Goodwin and MacKinnon have roots on the Miramichi, making this race almost a homecoming for them. Other notables on the entry list include Karl Schaefer, Gary Wade, and Brennan MacInnis, who will make the 7 hours haul all the way from Cape Breton to Miramichi! Taking on the Maritime Street Stock stars will be a strong field of Miramichi talent, led by defending race winner Brad MacLean. MacLean, who has clinched the 2018 Miramichi championship despite there being 1 race remaining, enters the race as the hometown favorite to repeat. Besides MacLean, fellow Mighty Miramichiers on the entry list includes Chris Wilson and Deryk Murphy, who are in a heated battle for 2nd in points heading into Saturday. Brandon Hollier has spent lots of time testing his car hoping for a strong run to cap off his year, while Jared Tozer and Tyson Donovan are expected to make their first starts of the season as they shake down their new cars. Former Blackville native Shawn Furlong will also be in attendance and is expected to be driving the #16 in memory of Amy Jardine once again. This Street Stock race promises to have lots of excitement. The abrasive 50-year-old surface at Speedway Miramichi makes for some of the best Street Stock racing anywhere, all while forcing drivers to conserve their tires during an extended race such as this one. It will make qualifying heat races more important, as drivers will want to start as close to the front as possible. The Pole race and the Pole challenge will also add elements of intrigue to one of the best races of the year. With a total purse of upwards of $5000, the winner of the race will be guaranteed $800, but could take home more than $1200, not to mention a 4-foot-tall trophy, should they capture all the bonuses on the line. A special shout out goes to John O’Shea for his efforts to raise money for the purse for this race, along with all those who contributed to the purse! Following the Street Stock 100 will be the year end Demo Blowout. The Dash for Cash, Powder Puff, Back-up Race, and Figure 8 race will as serve as qualifying races for the finale, which is a full-on Enduro with the final 10 cars competing in a classic Demolition Derby. After having 33 entries in the September demo, the car count appears stout once again this time around. 2018 Track Champion Joey Pitre leads the list of expected competitors, which includes Randy Girouard, Jay Skerry, Amber Sickles, Shawn Sisk, with many more expected on race day. With interest being expressed from all corners of the province, its shaping up to be another thrilling demo! It will be the final opportunity for Demo fans to catch some crashing and banging action in 2018, so don’t miss it! The undercard for the Street Stock 100 will be a Mini Stock 50 lap feature. 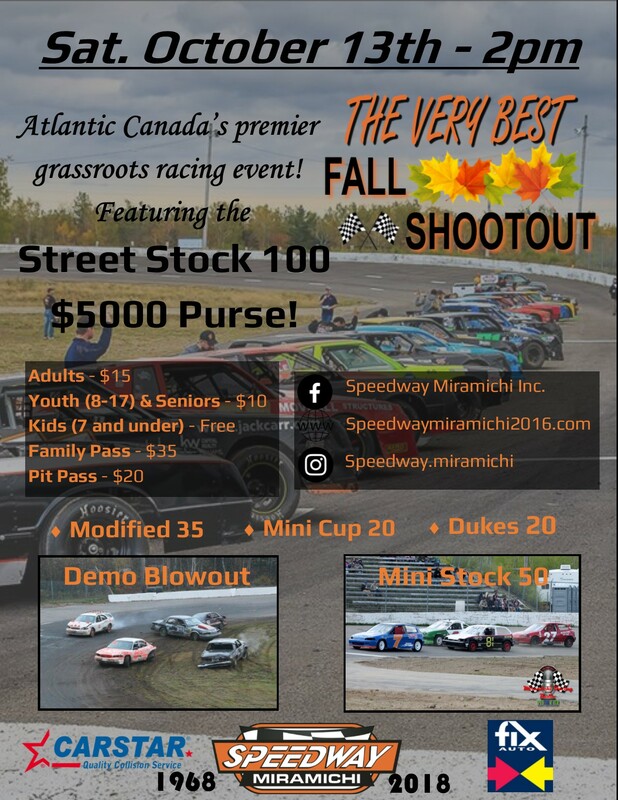 A sizeable field of Mini Stocks is expected to make the trek to Miramichi for the race, which also serves as the final points race of the year. Points leader Rob Poirier only has to start the heat and feature to clinch the championship, but a tight battle is taking place behind him for 2nd place between Guy Basque, Travis Conroy, Mathieu Mallett, Michael Savoie, and JR Lawson. Basque has somewhat of a gap over 3rd, but 3rd place to 6th is separated by just 4 points. Rob Poirier has won the last 2 50 lap Mini Stock features in Miramichi, but back in September both Travis Conroy and JR Lawson managed to out duel him to capture feature victories. They won’t be the only stiff competition in the field, because on top of the points contenders mentioned above, drivers from across the Maritimes are expected to contend for the win, including PEI’s Harley Cornish and Nova Scotia’s Chantel Ackles. Also expected to be competing in the 50 Lap feature are local favorites Mitchell Poirier, Casey Munn, Samantha Flieger, Timmy Blakely, Michel-Andre Poirier, and Wesley Peterson, among others. The 50 lap Mini Stock feature will be presented by silver sponsor Carstar Collision, and bronze sponsor Miramichi Honda. The Atlantic Modified Tour feature could be the race of the weekend, because of how the point standings sit heading into it. Serving as the final points race for both the Tour and Track championships, the track points sees the top 5 drivers being separated by a mere 7 points, promising an intense battle to the finish. 2011 AMT Champion Joe Hoyt, who leads the Tour points for 2018, leads the Miramichi Modified points over “Mr. Excitement” Doug Matchett by just 1 point. 4 points back is Braxton Stafford, who claimed the 2018 Petty International Raceway Modified championship, with John Lyons and Kevin Bailey sitting 6 and 7 points behind Hoyt respectively. Any of these drivers could walk away as the first ever Speedway Miramichi Modified champion at the end of the 35-lap feature. The Modified tour has had an extremely competitive season, with 8 different winners in 11 races. Matchett has yet to score a win and could become the 9th different winner in 2018. Besides Matchett, local drivers Steven Curtis and Zean Dutcher, who is expected to drive the 2w for Chris Wilson, have both found a lot of speed late in the year and may find themselves in victory lane on Saturday. Rookie driver Kevin Brideau has battled transmission problems as of late, but Brideau expects to have those problems behind him, and he will be seeking a strong final run of 2018 to wrap up Rookie of the Year honours. James Matchett, who also had mechanical issues at the last race, will be looking to finally get a full race under his belt in a Modified car. One big story line that is not to be lost among the many storylines, is the long-awaited return of “The Racin’ Ranger” out of Renous, Kim Hallihan! While Kim has competed as a substitute for many Modified drivers over the years, he recently struck a deal that saw him take ownership of the former Greg Butler #1 car. This means that Kim will be behind the wheel of his own car! While we are not sure if the car will have #1 or #97 on it, having “The Ranger” back behind the wheel racing against Yves McCray and Zean Dutcher will no doubt be a thrill for long-time race fans. The Dukes race will be a highly anticipated race this weekend as well. Rumour has it that Maritime Motorsports Hall of Famer and Miramichi Sportsman icon Frank McKenzie could also be climbing behind the wheel to drive one more time. McKenzie, who turned 80 years old this summer, was one of the most popular and successful drivers to ever compete at Speedway Miramichi. And while the spotlight may be on McKenzie for this weekend, the points battle for the Dukes should not be overlooked. Robert Legere and Darcy O’Neill have waged a war throughout the year, and currently sit just 4 points apart with Legere on top. Both drivers are former track champions and promise to put on a show this weekend as they look to settle a season long battle. The Dukes race will be presented by silver sponsor Fix Auto Miramichi (Donnie’s Collision Center). For the first time in 2 years, the Eastern Super Mini Cup Series will be in the pits to contest their season finale race. Indications suggest that Miramichi will have just a lone entry in the mini cup race, with that being mini cup veteran Kirk Sheasgreen. One other New Brunswick native is expected to compete, with that being Saint John’s Mark Ferguson, who only has to show up to clinch the championship. Per the Tim’s Corner release, PEI will be well represented in this race too, with 2018 feature winners Donnie MacNeil and Jacob Dunlop leading the charge of approximately half a dozen islanders. A full series release can be found on Timscorner.ca. Drivers are reminded of the open practice being held on Friday night, weather permitting, from 4pm to 10pm! It will be a busy day Saturday at Speedway Miramichi, with the green flag dropping at 2pm. Pit gates open at 10am Saturday morning. Admission prices for the pits is $20 for everyone (*NOTE – free driver admission DOES NOT apply to the Fall Shootout weekend), and pit access is restricted to those 8 and older, with any youth under 18 being required to have proper waivers and parental consent to gain access to the pits. Grandstand admission is $15 for adults, $10 for youth (8-17) and seniors, and kids 7 and under are free. The family plan pricing will be in effect as always, $35 for a family of 4, with each additional child being admitted for just $2. Grandstands open at noon.